It was a pretty quiet week for trading. It was a quiet week with just a handful of trades. Daytrade systems overall had a profit for the week. 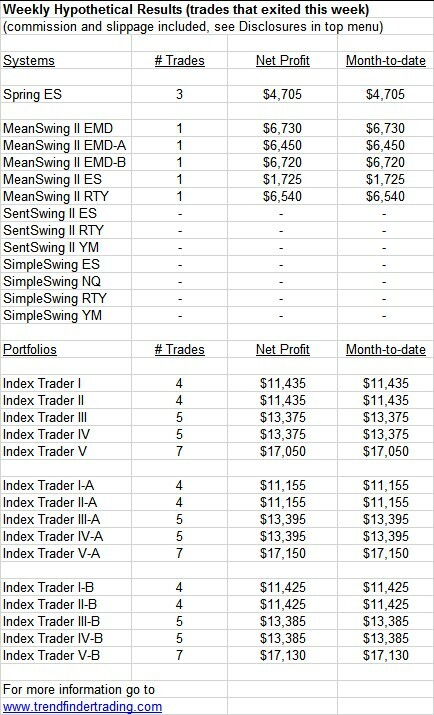 The swing systems had a loss. It’s pretty unbelievable how poorly the swing systems have done over the past 12 months. I will be closing or replacing all of them. 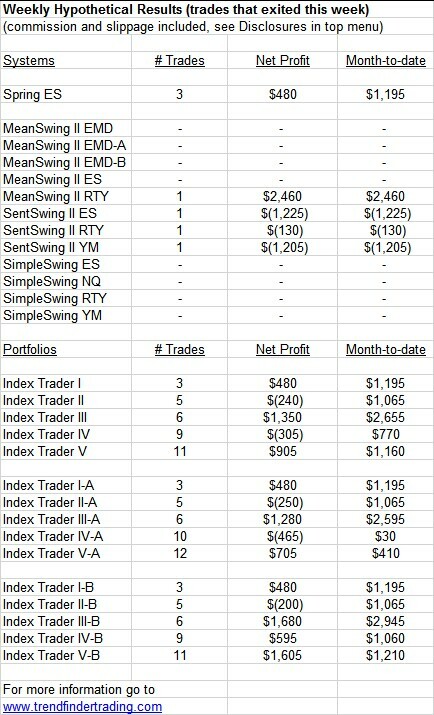 I have tested using volatility to adjust the parameters in each swing system, and the results greatly reduced drawdowns. In case you were wondering, I have yet to find a trend/momentum system (something other than mean-reversion) that works for stock index futures. Therefore, for the Index Trader portfolios I will be adjusting the swing systems to still be mean-reversion in nature, but be more conservative to reduce drawdowns. 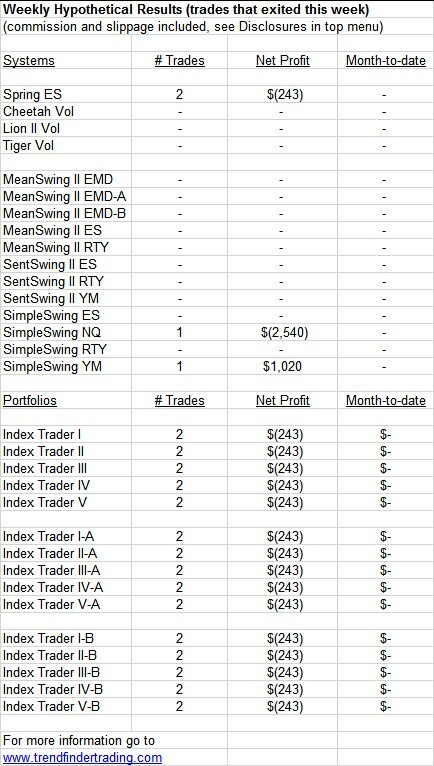 If you are trading one of these portfolios, please know that you can ask your broker to not trade specific systems if you desire. I do not have this power. The choice to trade each system is yours. The intraday systems have been doing very well, and to control risk, you could instruct your broker to only trade the intraday systems. Intraday systems had a few trades with mixed results. SentSwing II was stopped out of a short trade. The current rally may be running out of steam – we will find out next week. If that occurs then trading results should improve. 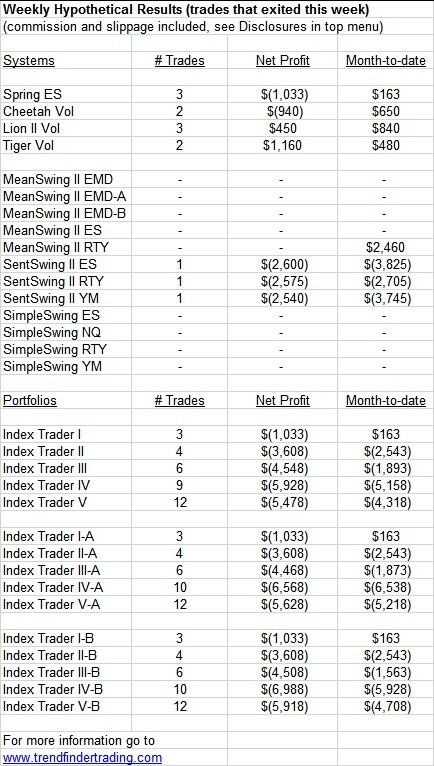 MeanSwing II exited a short trade, and SentSwing II exited 3 long trades. Every intraday system had trades this week, and overall they were profitable. The 3 most recent Fed chairs were interviewed this morning. Powell changed his tune about forward policy (said they would consider market reactions to any rate or balance sheet adjustments, especially relating to downside reactions), and said he wouldn’t resign if Trump asked him to. The other chairs reinforced Powell’s comments and lauded his transparency. To me, it seems they are trying to remove uncertainty because markets hate uncertainty. And, if this is their thinking, it makes me wonder, why are they trying to be so supportive of the markets? They seemed to be putting up a good show this morning of not being concerned, but was it just a façade hiding their true concerns? 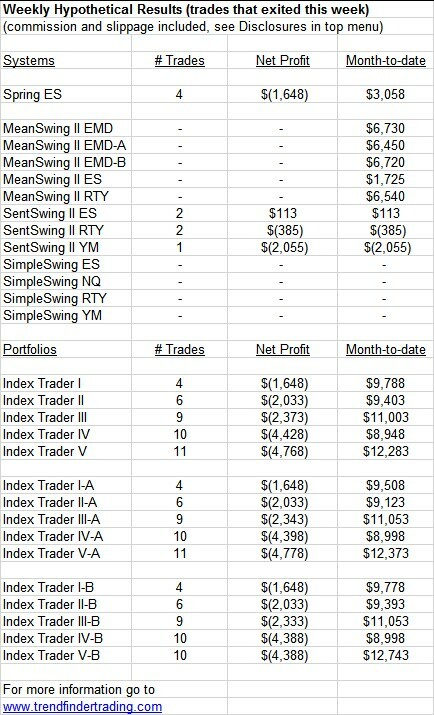 SentSwing II and SimpleSwing were stopped out of long trades, and the intraday systems had a profitable week. 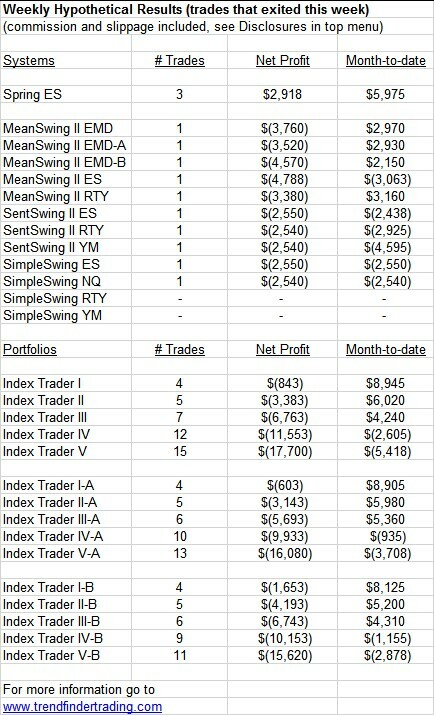 Spring ES did well this week, but all other systems that traded had a loss. This week, especially today, saw large outflows from the stock market. With this large liquidation, more positive Fed flows next week, and potential for pension funds and other institutions need to rebalance (buy stocks and sell bonds), we will see if the market will stage a rally for the end of the year. Overall, the systems had a loss this week. There is an FOMC meeting next week, so we shall see if this triggers a market move in either direction. The VIX is not going up in the same proportion to previous market drops. This may be because participants are already sufficiently hedged and/or participants are complacent and think the market will rally. I have no prediction what this means! These systems will trade based on what happens. December got off to a very good start for these systems. 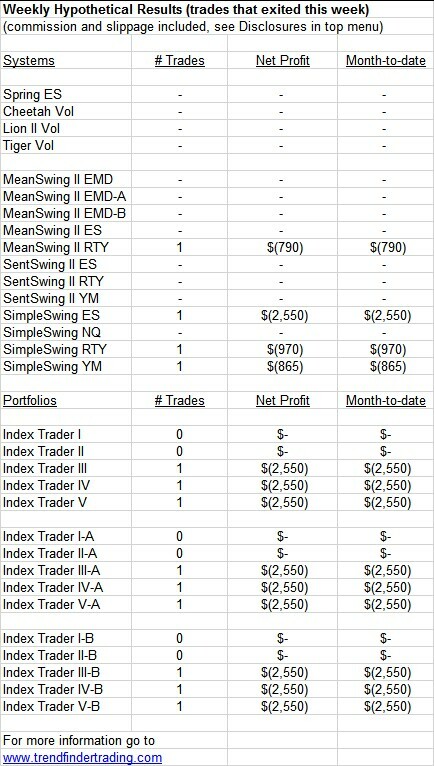 MeanSwing II exited short trades on Tuesday. 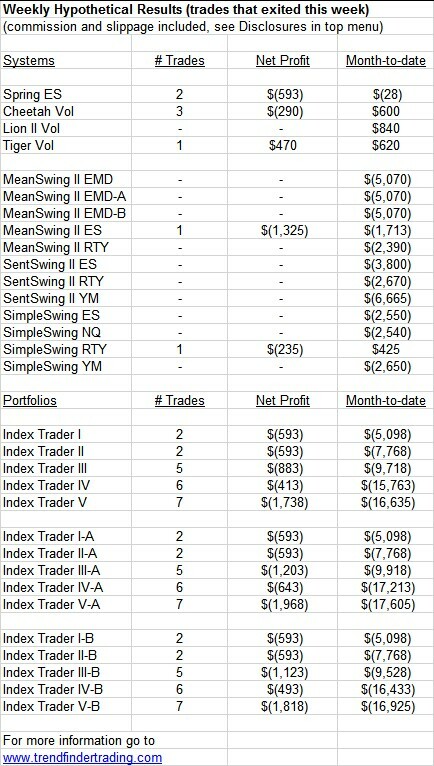 Spring ES, Cheetah Vol and Lion II Vol each had profitable day trades.